I think that any tree - even the least valued one - is a miracle. 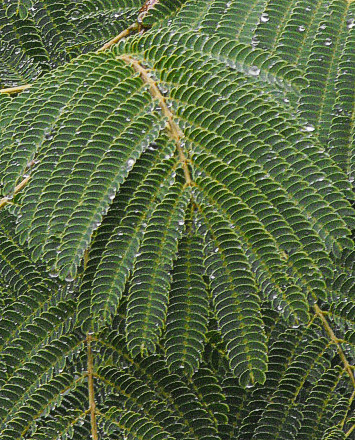 This view of the top branches of an Albizia julibrissin caught my sight - and my heart - early morning today when, after a night of gentle rain, I have clumsily stumbled out onto our bedroom balcony and discovered that there was a gorgeous day in the making. Below: Details of the branches. The more one observes what some consider a dumb and non-intelligent Nature, the more amazed and puzzled one remains. Where does all that fancy and artificial-looking geometry come from? And the perfect shapes of the water droplets which, thanks to the waxy surface of the leafs, seem to be levitating spheres?